The Thala Ajith starrer Vedalam directed by Siva, released 6 days back on November 10th for Diwali. The film shot up from Day 1, setting a record pace at the TN box office. Today, November 16 it completes its first week run and the Tamil Nadu gross at the end of the first week is reported to cross a massive 50 crores. The film is apparently drawing the family audiences in large numbers despite heavy rains across the state. Vedalam has also got the tax-free status thereby making it more viable for the trade stakeholders. It is an extra-ordinary run so far, say trade sources. Kudos to the team. Stay tuned for more on the film's box-office exploits. And what’s that surprise date Dhanush and Anirudh are hiding from us? Even the rains could not stop Vijay! 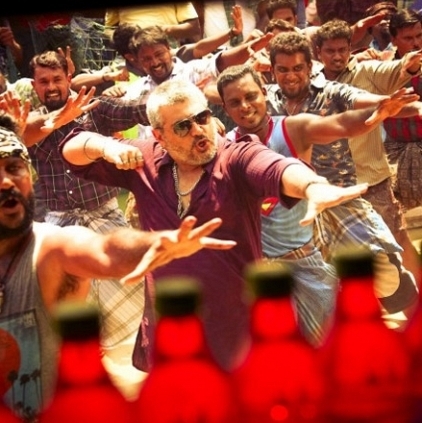 Anirudh To Officially Release The BGM Of Vedalam Soon. People looking for online information on Vedalam, Vedalam box office collections, Vedalam Tamil Nadu box office collections will find this news story useful.